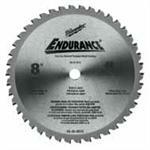 Carbide tipped saw blades offer the precision and power your jobs demand. The quality of the finished product relies heavily on the quality of the tools you use. That’s why U.S. Diamond Tool carries only the most dependable equipment. General contractors, carpenters and other hardworking professionals need circular saw blades that won’t bend, break or become blunt after a few uses. Our unstoppable 8” carbide tipped circular saw blades are available in 50 and 42 tooth styles with hardened steel bodies, 5/8” arbor holes and vibration dampening benefits. Slice through wood faster and produce a clean, perfect edge every time. Carbide tips are known for their durability. Most will last 10 to 20 times longer than tools with a steel cutting surface. As a professional, time spent re-cutting or cleaning up a poorly cut edge will mean lost profits. Make sure your circular saw blades are up to the challenge that comes with every job you take on. Our Endurance carbide tipped saw blades will keep you cutting so you spend less time on equipment maintenance and more time getting the job done right! Explore our collection today and discover the difference that carbide tipped circular saw blades can make.